The text of David Hassler’s play is based on the Kent State Shootings Oral History Project, begun in 1990 by Sandra Halem and housed in Kent State University Libraries’ Department of Special Collections and Archives. The collection is comprised of over 110 interviews, with first-person narratives and personal reactions to the events of May 4, 1970, from the viewpoints of members of the Kent community; Kent State faculty, students, alumni, staff, and administrators who were on campus that day; and National Guardsmen, police, hospital personnel, and others whose lives were affected by their experience. Weaving these voices and stories together anonymously, Hassler’s play tells the human story of May 4th and its aftermath, capturing the sense of trauma, confusion, and fear felt by all people regardless of where they stood that day. 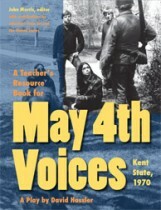 Created to supplement May 4th Voices, a play based on the 1970 tragedy, A Teacher’s Resource Book for May 4th Voices: Kent State, 1970 explains how real teachers in real classrooms have adapted the play to use in various pedagogical situations and levels of instruction. It offers lesson plans and background material for students and teachers, describing the national mood in 1970, the events in Southeast Asia that heightened tensions on U.S. campuses, and the culture of antiwar dissent both nationally and within the community of Kent, Ohio.